A veteran of efforts to rebuild Iraq explains how the Bushies botched it. It was April 21, 2003, ten days after the Bush administration�s �shock and awe� air war against Iraq had ended. Much of Baghdad was in ruins. The ground war was raging north of the ancient capital, and the country�s oil wells were burning out of control in the south. 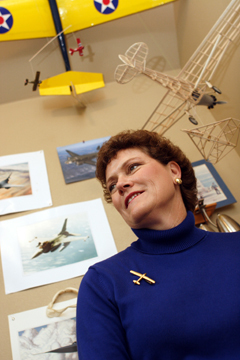 Air Force Col. Kim Olson was on her first inspection tour of Baghdad with her boss, retired U.S. Army Lt. Gen. Jay Garner, who had been called back into service by Defense Secretary Donald Rumsfeld to head up the Office of Reconstruction and Humanitarian Assistance in Iraq. Garner had tapped Olson, then in the Pentagon comptroller�s office, to be his executive officer. They were walking through a bombed-out but still-operating hospital, when the woman pulled Olson aside. The aging nurse, �glancing fearfully around,� quickly whispered her desperate plea for help into the ear of the only woman in the general�s party. Within minutes, a generator would be on its way. The water trucks and medicines would come next. And, of course, the wounded and dying would continue to fill the rubble-strewn halls. Olson, now retired and living in Weatherford with her husband and two children, recounts the incident in the first chapter of her gripping book, Iraq and Back, Inside the War to Win the Peace. She�d been in Baghdad only an hour, she wrote, but already she was seeing the �destruction and desolation ... anger and despair� that would define Iraq for her and Garner as they began what she now calls their �mission improbable�: rebuilding Iraq�s infrastructure, delivering humanitarian aid, and laying the foundation for a democratic government. Garner, Olson, and the rest of the reconstruction agency were only 100 days into what they believed was a slow but sure accomplishment of that task when Garner was abruptly replaced by a civilian, Paul Bremer, a former senior director of Henry Kissinger�s international consulting firm. Garner said that Rumsfeld told him that the move had always been part of the plan � but if so, the general had not been privy to it. The book recounts what happened during her time in Iraq and also Olson�s own dogged journey through an often unfriendly male-dominated military establishment as one of the Air Force�s first generation of female jet pilots. She rose in the ranks to become a command pilot with more than 3,700 hours of flying time in six different types of aircraft. �My story is a woman�s story,� Olson said recently as she ate pancakes and eggs in a crowded blue-collar caf� on Fort Worth�s far West Side. These days, when she�s not on the lecture circuit, she spends her time volunteering at the Tarrant County veterans� health clinic and advocating for better care for the wounded returning from what she calls that �disastrous� war. Observers believe that Garner was removed by the Bush administration because of his distrust of Ahmed Chalabi, the Iraqi exile leader. Chalabi, in his efforts to promote the invasion, had been passing along to the American government what later proved to be erroneous intelligence. After Baghdad fell, Chalabi wanted control of the Iraqi government to be turned over to him. Garner nixed the idea. �I thought he was a thug,� he told author Thomas Ricks, whose book Fiasco has been called the definitive account of what went wrong in the Iraq invasion aftermath. But Chalabi had powerful friends in Bush�s cabinet in those early days, and he worked hard to undercut Garner�s authority. Garner also butted heads with the White House over who should make the decisions on the reconstruction of Iraq and what to do with the country�s oil assets. Garner thought it should be the Iraqis and pushed for elections within 90 days after the fall and for the U.S. to pull its troops out of the cities to a desert base. �It�s their country and their oil,� he told one interviewer. Garner said Olson brought her perspective as a woman to understanding the Iraqi people�s needs. An example was Umn Qasr, a once-prosperous seaport town that was almost completely shut down, first by Saddam�s draining of the nearby wetlands, which caused the harbor to silt up, and then by the war. �When [Garner] toured the port, I thought of their medical system,� she said. �When [he] asked about their school sports equipment, I wanted to know about the books and qualified teachers.� And everywhere she went in Iraq, she saw her own two kids in the haunted eyes of the country�s impoverished children. The children had �no food, no water, no future� � but Olson thought that the U.S., under Garner�s plan, was about to change all that. Back in the U.S., Olson battled exhaustion and post-traumatic shock from the 18-hour days she�d put in as Garner�s executive officer. During that time, she�d been the target of assassins� bullets, barely missed being blown up in a truck convoy, and sat by Garner�s side as they listened to Iraqi leaders warn of the coming insurgency. But now she was also battling her own superiors. She was charged with violating the government ethics code while in Iraq by helping her and Garner�s non-military bodyguards (eight South Africans working for a London-based private contractor) set up their own security and police-training company, even though, as it was later proven, she acted only as an unpaid advisor and did not profit in any way. An angry Garner wrote in Olson�s defense that the charges were based on �fallacious allegations, undocumented evidence ... and poor senior leadership. ... She is a thoroughbred, and I ran her legs off. But the Air Force broke her heart.� The ethics charge, which carried a possible five-year prison sentence, was dismissed, but only after Olson spent $70,000 to defend herself. A charge of conduct unbecoming an officer was sustained; she received a reprimand and retired. �It was time for me to go,� she said. Garner, a veteran of two tours in Vietnam and the commanding general in Northern Iraq during Desert Storm, told the Weekly that Olson was never able to find out all of the charges against her or where they came from. He asked the Air Force investigators to allow him to write a letter on her behalf to be put into the record, but never received a reply. �On this one, the Air Force should be investigated, not Kim,� he said. Out of the Air Force, Olson joined her family in Weatherford, not far from her husband�s hometown of Mineral Wells. She finished her book, a no-holds-barred account of what she sees as this administration�s badly botched handling of the aftermath of the invasion and the tragic results of its misunderstanding of the Iraqi culture.